Which Type of 3D Scanner is the Best for Me? Check out our 3D scanner buyer's guide to the 30 best 3D scanners (DIY, handheld, desktop, and tripod mountable), plus an introduction to 3D scanning technologies. The 3D scanner market is a diverse space with a wide range of products that come in all shapes, sizes, capabilities, and prices. Such choice, while a great thing in itself, can make sorting the goods from the duds a chore. Well, we’re here to help. After trawling through the forums, marketplaces and best-seller lists, we can say with confidence that these are the 3D scanners worthy of attention right now. Each featured for their own distinguishing features, technology, price point or a combination of factors, we’ve tried to cover the spectrum from super affordable consumer devices to those suited to small business (and even a little beyond that). The EinScan Pro 2X, the new and improved successor of the EinScan Pro, is a lightweight and compact 3D scanner made for professional use, capable of capturing small-to-medium sized objects, and it does so at an incredibly high speed without sacrificing quality. Ideal for the classroom, the EinScan SE offer auto- and fixed scan modes at 100 microns of single shot accuracy. 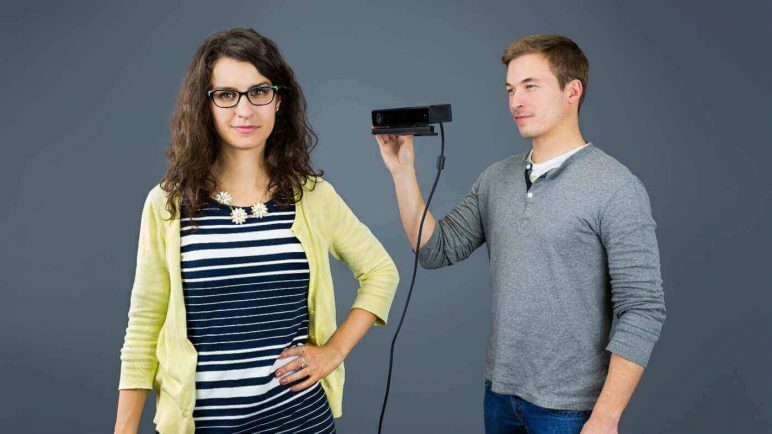 The second version of the Xbox One Kinect Sensor gaming sensor array is a fully fledged TOF 3D scanner. It wasn’t built to be one of the best 3D scanners in the world, but a combination of affordability, hackability and pretty decent tech makes it so. Sticking to Microsoft’s walled garden when using the Kinect as a scanner leaves you using a dedicated program from the company, which allows for basic to 3D scanning with the Kinect. You can specify the dimension of the space to be 3D scanned and the scan resolution itself — the means by which you scan is also up to you, be it stationary or handheld. The flip side of the program is that it runs only on Windows 10, exporting meshes into Microsoft’s 3D Builder. Only here can you choose a file format and access repair tools. Beyond this, Kinect has seen widespread adoption in teams and companies willing to hack the inexpensive device for their own uses. The low price point and relative quality of the scanning tech make it a solid choice for above average scans without breaking the bank. That being said, Microsoft has discontinued production of the Kinect, and no longer even supports it on its own consoles. That means what’s left out there hardware-wise is it. The official support from Microsoft will degrade in time, but that’s not necessarily a deal breaker since the hacked usages for the Kinect as a 3D scanner are way more interesting. One for the tinkerers. 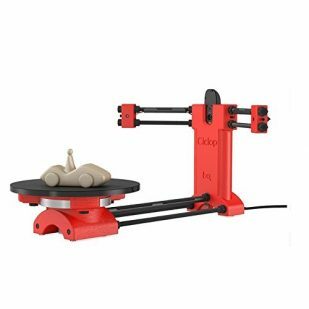 The BQ Ciclop DIY 3D scanner kit is a fully open source project licensed under the GPL license. Following the RepRap philosophy, the many components of the Ciclop are 3D printed. The electronics at the heart of this 3D scanner can be purchased as a kit; they consist mainly of a customized Arduino board and a Logitech webcam. The processing of data captured by this laser 3D scanner is a dedicated scanning suite called Horus, also Open Source. Be prepared: It’s not easy to assemble. BQ has admitted to the difficulty of setup and calibration as well as inconsistencies in the build quality (accuracy) of the individual components for this 3D scanner. You can find the printable files over on GitHub and the bill of materials and build guide on the Diwo BQ website. In terms of being open source and usability, the Ciclop 3D scanner is one of the best, but making it work can be a real challenge – but that’s probably half the fun of such a project. A good learning experience. Note: being an open source project, that means you’ll likely find the Ciclop available under a number of different names and companies that have adapted it slightly (or straight out sell it as their own). BQ is the originator of the Ciclop scanner. 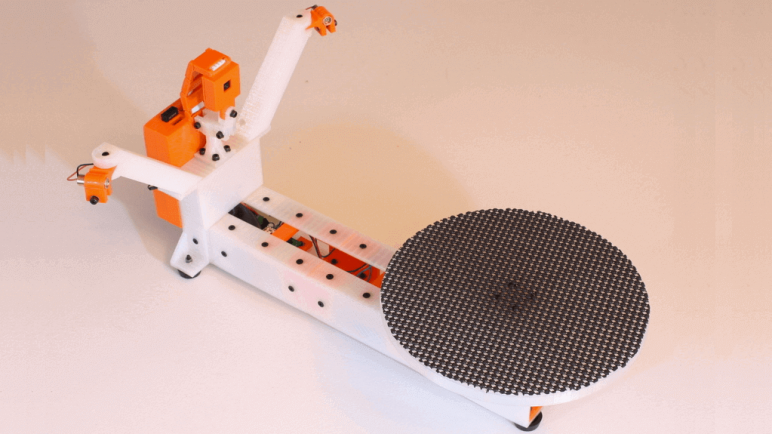 The FabScan is a DIY 3D scanner kit that Francis Engelmann developed as his bachelor’s thesis in 2011. In its basic form, it was a laser 3D scanner synchronized with a turntable. The design was improved by subsequent students at RWTH Aachen to push the price from $150 to only $100. However, a kit with all the required parts can set you back up to $200. Before making a choice, it might also be worth comparing the different versions of the FabScan. The most recent incarnation makes use of the Raspberry Pi Cam to improve the scan quality. 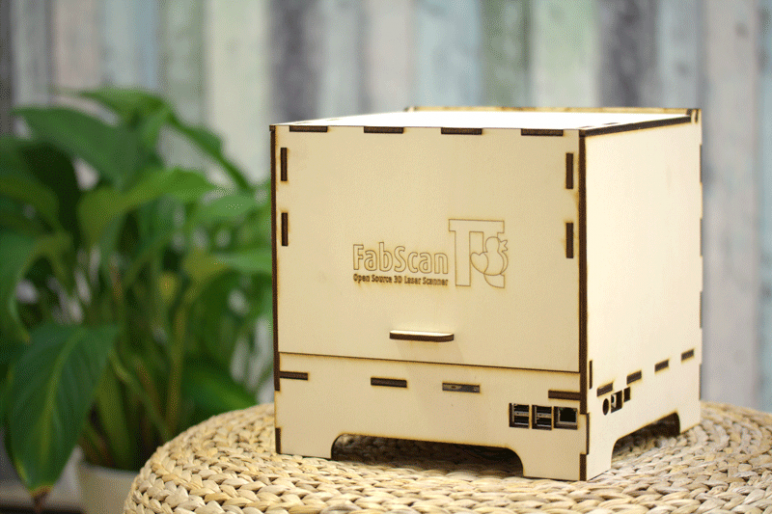 While building a laser 3D scanner at home is certainly not for eveyone, the FabScan is a solid 3D scanner for anyone wanting to learn all about 3D scanning from scratch. 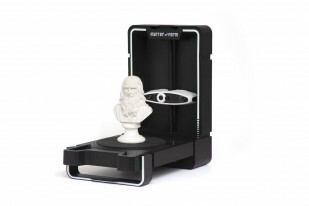 As one of the most affordable 3D scanners on the market, the XYZ 3D Scanner Pro from XYZPrinting is a popular entry-level choice for beginners on a strict budget. It comes with four different scanning modes that enable users to capture a multitude of different objects, such as the head, full-body, faces, and simple, everyday items. 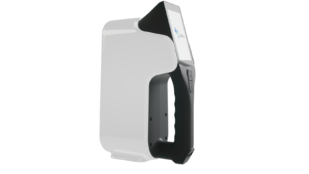 Despite the low $219 price tag, the XYZ 3D Scanner Pro offers a spatial resolution of 1 to 2.5mm and a decent scanning range. However, keep in mind, as with most commodities in life, you ultimately get what you pay for. So if you need a 3D scanner that will deliver professional-quality results and more extensive features, it’s probably worth shelling out a few extra bucks for a higher-end option. 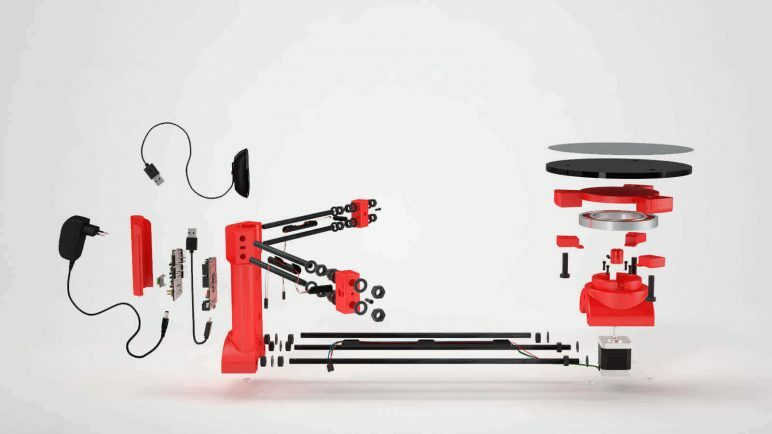 The Atlas DIY 3D scanner is kit scanner you construct from scratch, including the 3D printing of the frame (should you choose – an acrylic add-on purchase is also available). Setting you back $209 if you already own a Raspberry Pi you can install inside the 3D scanner, or $244 for a kit including a Raspberry Pi 2 or $229 for the Raspberry Pi B+. The Raspberry Pi camera feeds into the Atlas 3D scanner producing crisp textured 3D scans. Like other DIY 3D scanners, the Atlas comes with its own tailored program, FreeLSS. Atlas’s usability is particularly convenient for a DIY 3D scanner: you access the device in your browser via the built-in WiFi adapter. 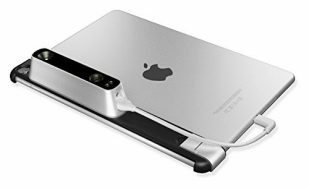 The Occipital Structure Sensor is multi-purpose handheld 3D scanner with a wide range of applications. The software provided by the manufacturer is called Structure SDK, it offers high-level developers tools and full low-level access for a game and mixed reality development and 3D mapping. Apart from that, the device can be used to create high-quality 3D models of objects for a variety of purposes, including 3D printing. 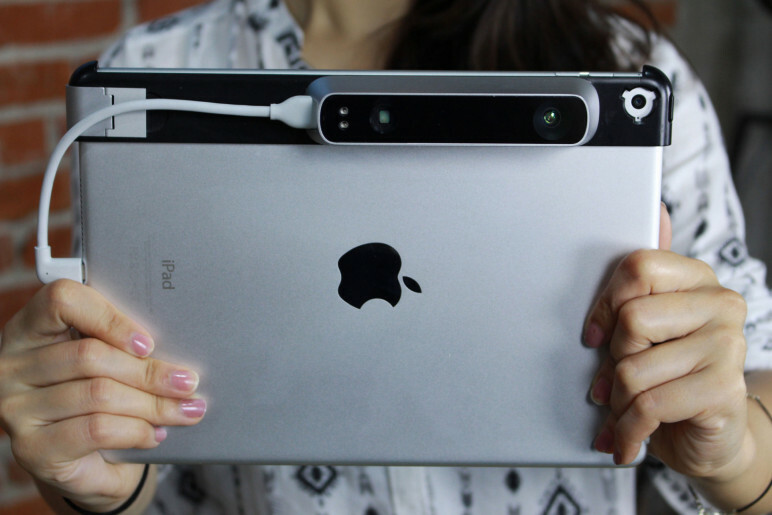 Though this 3D scanner add-on was originally designed for use with iPad and iPhone, the company offers ‘hacking’ guides to get around any obstacles keeping you from using other platforms like Windows or Linux. Unfortunately, not all technical specifications are available. 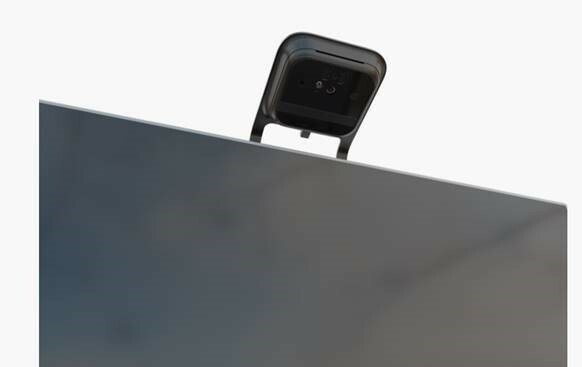 Occipital continues to update the Structure Sensor 3D scanner to be mountable/compatible with new iPads, with recent revisions released for the 6th Gen iPad and iPad Pro. 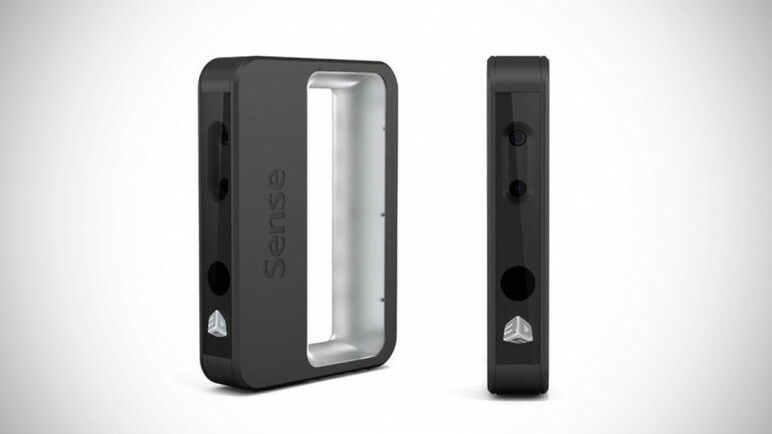 Currently on Version 2, the Sense 3D scanner is the successor to the company’s now defunct tablet/smartphone-mounted iSense. 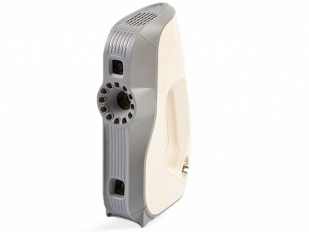 Connected to a Windows device (Windows 8 or later) via USB 3.0, the Sense provides a competent handheld scanning solution for capturing models for archival and asset creation for digital content. Accomplished object tracking makes the Sense’s active building of a 3D model a cinch, giving a handheld scanning solution that outputs relatively high-geometry and good texture quality, quickly. The Sense 3D scanner has an operating range of 20cm to 160cm, capturing full-color images and seeing all within a 45 degree field of view. 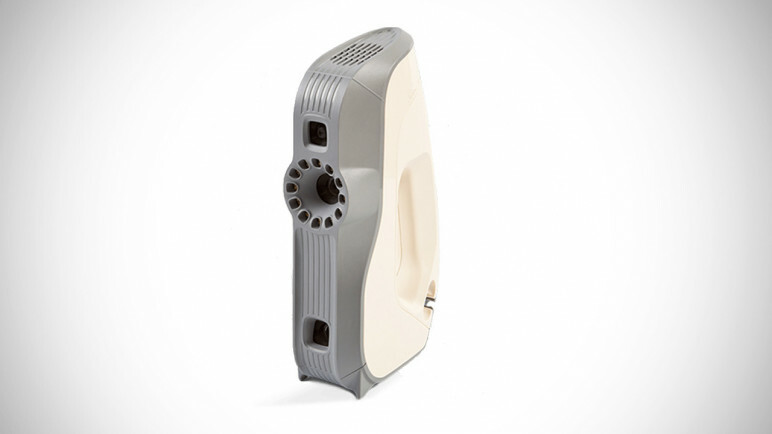 That offers pretty good flexibility for a handheld 3D scanner of its size. 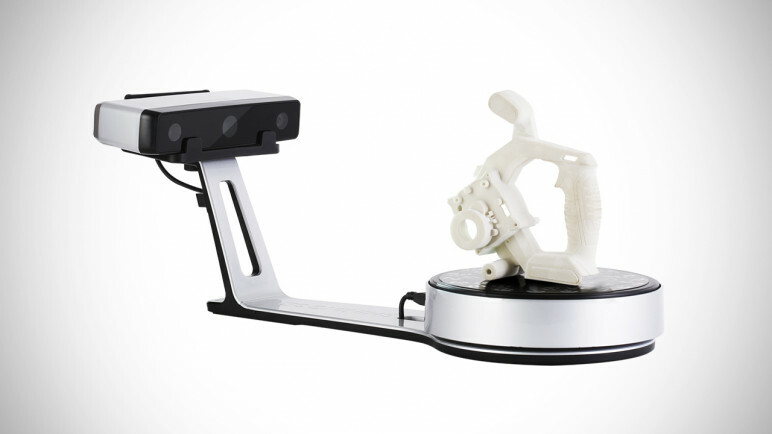 The Matter and Form 3D Scanner is a desktop laser 3D scanner. 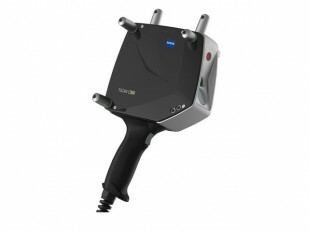 It is capable of producing high-resolution, full-color 3D scans. This is made possible thanks to 2 lasers and an HD-CMOS sensor. Altogether, a scan accuracy of up to roughly 0.25mm and details as small as 0.43mm can be achieved. The accompanying (free) software is designed to create watertight STL files that are immediately ready for animation or 3D printing. If you use a USB cable, you can connect the device directly to your computer. And best of all, it folds up for easy portability. First debuted at CES 2018, the tech giant HP Inc. made some serious waves with the launch of the innovative HP Z 3D Camera attachment. Focused on offering a much more affordable alternative to the Sprout Pro 3D camera, which costs upwards of around $3,000, the Z is a portable option that can be attached to most monitors. Best of all, the price of this 3D camera device is just $599. It shares many of the same features as the Sprout Pro, capable of capturing and digitizing 3D objects, 2D documents, and live video. However, it does lack other useful attributes such as projection capabilities and multitouch. The HP Z Camera uses a technology called SLAM (Simultaneous Localization and Mapping) to track, scan, and construct a 3D model in real time, resulting in high-resolution “computer-graphics-friendly” images and textures can then be used for various 3D and VR applications. 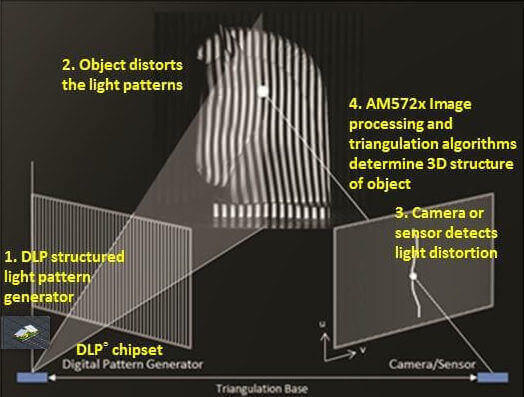 Utilizing a 3D depth-sensing camera and a 14.6MP 2D camera, users can scan an object by simply rotating it in your hands and positioning it underneath the camera. Captured 3D objects can be exported directly to PowerPoint 3D, Paint 3D, and Mixed Reality Viewer. 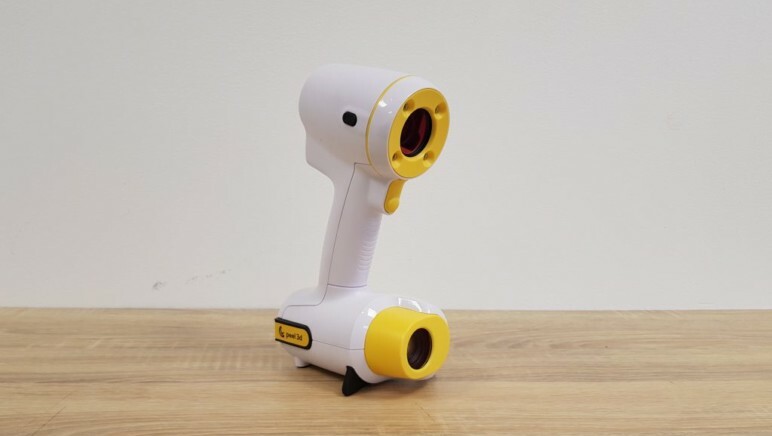 According to the manufacturer, this affordable 3D scanning attachment was made with CG artists, designers, game developers, and artists in mind. What’s that? A laser-based device that transforms your smartphone into a 3D scanner? With that kind of innovation, it’s no wonder the EORA 3D scanner raised nearly $600,000 on Kickstarter back in 2015. Since then, this $599 device has hit the mass market, aiming to make 3D scanning more accessible to the everyday person. Understandably, you might have reservations about a 3D scanner that utilizes a smartphone as its primary engine, but the EORA manages to generate some surprisingly high-quality scans. 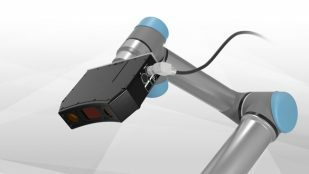 For short range scanning distance, which is anything within three feet, its capable of achieving results that are accurate up to under 100 microns. You can even use an optional Bluetooth turntable to expand the overall 3D scanning possibilities. 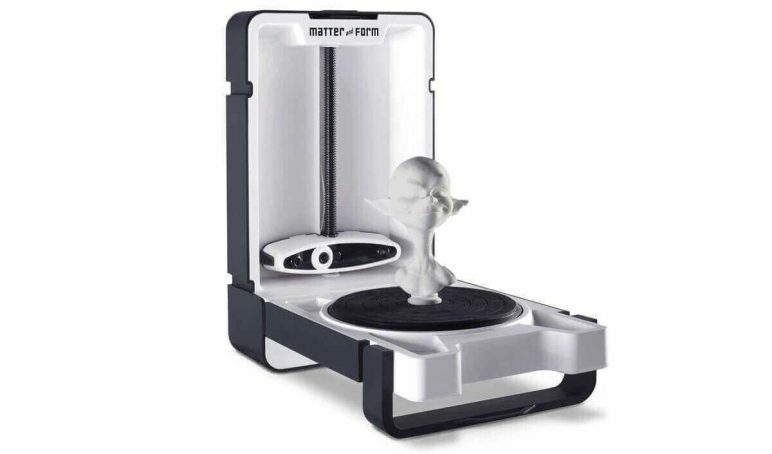 The successor to the Matter and Form V1, the Matter and Form 3D Scanner V2 retains the hardware of its V1 and introduces usability improvements. Think of it as an optimization of the V1 — a scanner that (in operation with up to date software) does an admirable job for its price. Bundled with the new MFStudio software, the Matter and Form V2 is capable of capturing geometry faster than before when used alongside the optional +QuickScan software upgrade. As before with the V1, USB connection to your computer makes the Matter and Form V2 a desktop scanner through and through. And a foldable form factor lets you collapse it down for easy portability. 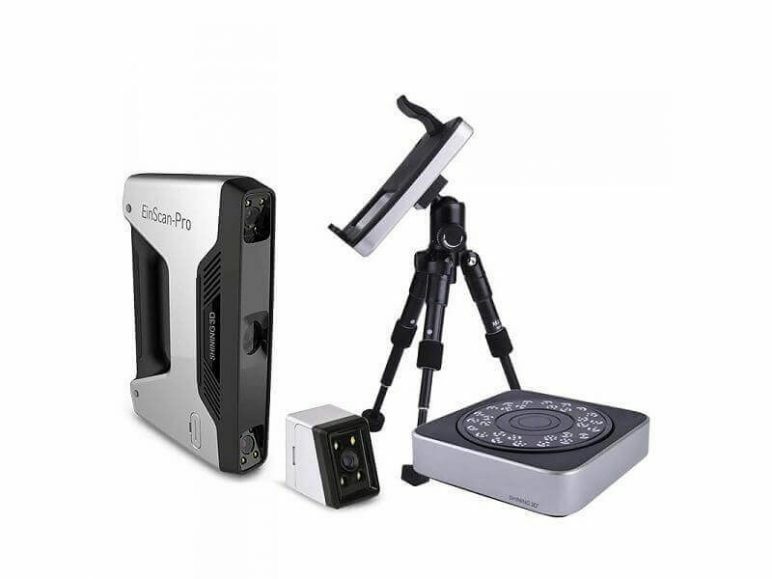 Part of a recent two-product launch of desktop 3D scanners (as successors to Shining 3D’s Einscan S D scanner, Shining 3D’s EinScan-SE system offers a well-rounded package for beginners and educators looking to get acquainted and output quality scans with little fuss. 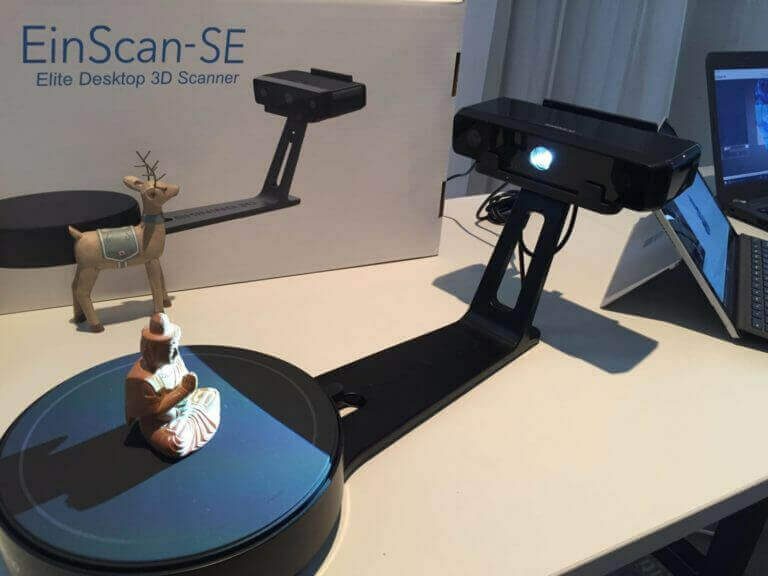 The result of feedback from thousands of users of the EinScan-Pro — the company’s handheld scanner — these newer scanners present a move to capture the whole market (something furthered by Shining 3D’s recent move into 3D printing, too). The EinScan-SE is mainly pitched at education, and comes with software that aims for ease of use, automating enough of the process for any user to quickly 3D scan and generate a CAD model. Part of this software solution auto-meshes the scans too, making them fit for 3D printing. 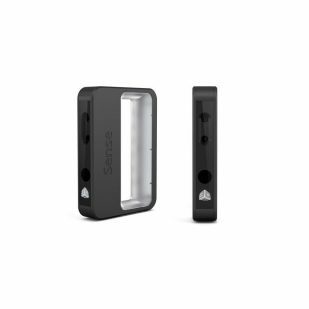 Offering an auto-scan and fixed scan mode, the SE 3D scanner boasts a maximum single shot accuracy of below 100 microns. 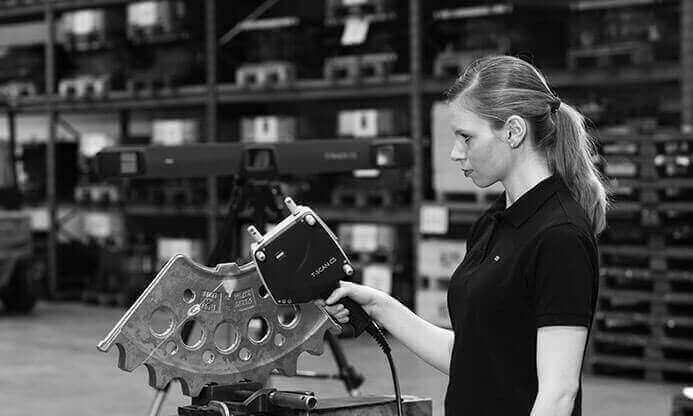 EinScan’s professional level 3D scanner, the EinScan-SP builds upon its SE sibling by increasing the accuracy, speed and capture volume. Overall the proposition is one appealing to the power user in need of quick and accurate scans in a professional environment. Like the SE, the EinScan SP 3D scanner offers auto-scan and fixed scan modes, and a single-shot accuracy of below 50 microns. 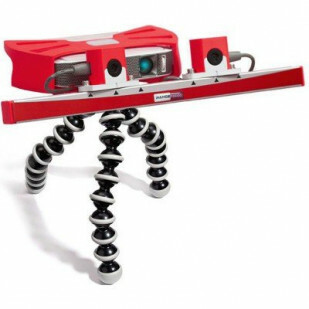 The NextEngine 3D Scanner Ultra HD offers both portability and super high fidelity 3D scanning. This high-end device uses an electro-optical system with a laser array that scans in tandem. Another key feature is that the NextEngine 3D scanner can composite scans together, making it capable of capturing detailed full-color scans of objects far larger than its field size. 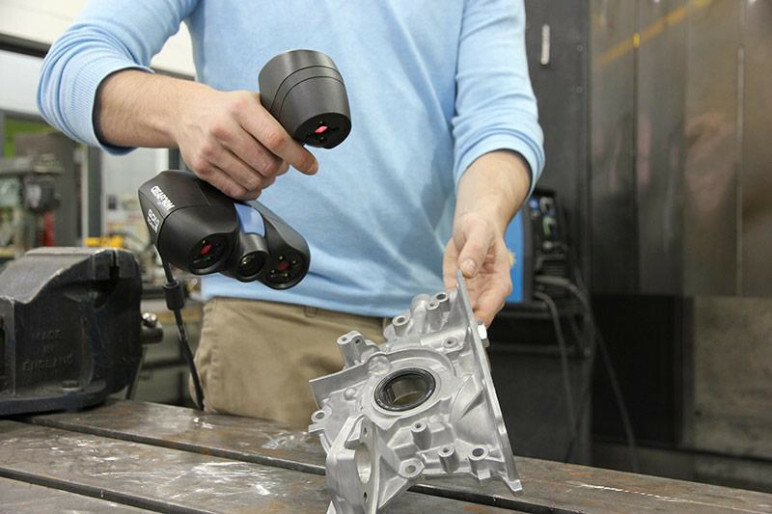 Plug-and-play operation rounds the NextEngine 3D Scanner Ultra HD out as an attractive option that blends relative affordability with high-quality turnkey desktop/handheld scanning. Primarily marketed to Europe and Asia, Rangevision’s scanners are positioned as the affordable option for professionals in need of high quality scans for a variety of use cases. The most recent of the company’s wares (although it is a few years old now) is the Smart, a rail-based structured light 3D scanner. 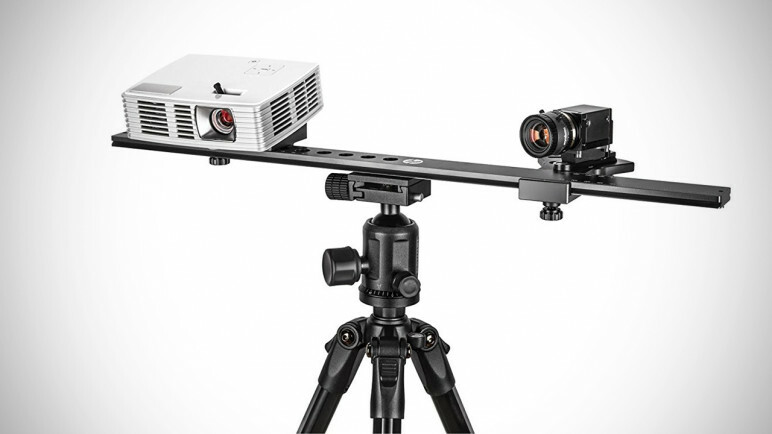 Capable of capturing detailed scans from mere centimeters to over a meter, the Smart features two auto-focusing HD camera out of the box, which pick up the patterns projected from the included projector. We understand that at launch the Smart 3D scanner suffered from unclear instructions and difficult to use software, which has subsequently been improved upon with regular updates, making it a contender worth considering today. It also comes partially assembled in a spiffy carry-case, which is nice. The HP Structured Light Scanner Pro S3 is the upgraded version of its S2 sibling listed above, and is also a rebadging of a former David Vision Systems scanner, the David SLS-3. Differentiating the two is the inclusion of a more capable HD camera, instead of monochrome snapper affixed to the S2. 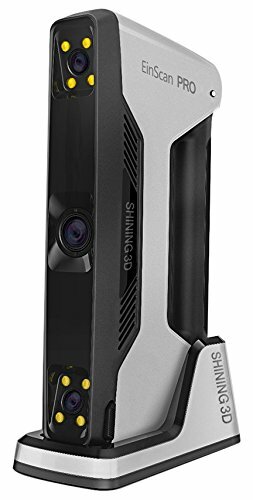 Available as a full package packing two of its industrial grade cameras, the S3 is a modular 3D scanner powerhouse that, while tipping toward the more expensive end of the spectrum, is a winner with its modular setup and high quality output. The EinScan-Pro and EinScan-Pro+ are both exceptionally multi-functional 3D scanners that can capture objects both big and small. 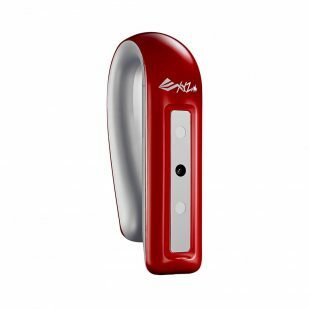 You can use it as a fixed or handheld 3D scanner, and it offers both rapid and HD scanning modes. Overall, well-suited for a variety of 3D scanning situations. 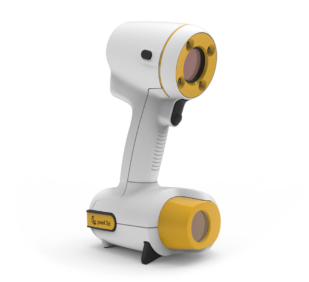 The EinScan-Pro series uses white light 3D scanning technology, enabling high accuracy and speed. This professional-grade system can utilize good color texture capture for objects ranging in size from 0.03mm up to 4 meters. 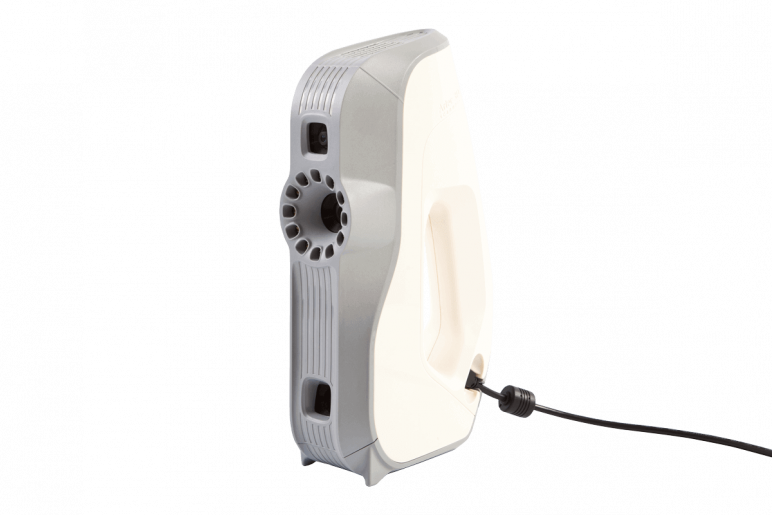 Manufactured in Italy, the Scan In a Box-FX (SIAB-FX) by Open Technologies offers a portable and highly modular professional-grade 3D scanner. 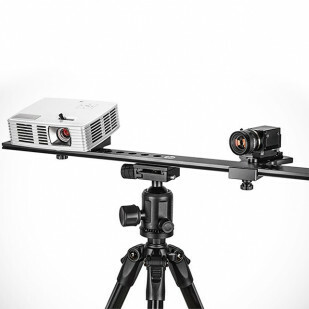 Equipped with first-rate structured light 3D scanning technology, this system has been upgraded from the standard iteration with an HD 450 Lumens Projector (DELL) the provides better brightness and color definition to captured objects. The SIAB-FX is capable of capturing a diverse set of objects that have dimensions ranging from 10 mm to 3000 mm. It also has new and improved curved cameras and video projector support for increased toughness and overall reliability. One main feature that should be highlighted here is the processing software that is coupled with the system, which comes with new features like direct object allignment, resilient scan mode, mesh defeature, and more. Priced at just over $5,000, this industrial-grade scanner is best-suited for applications like cultural conservation, design studies, or reverse engineering. 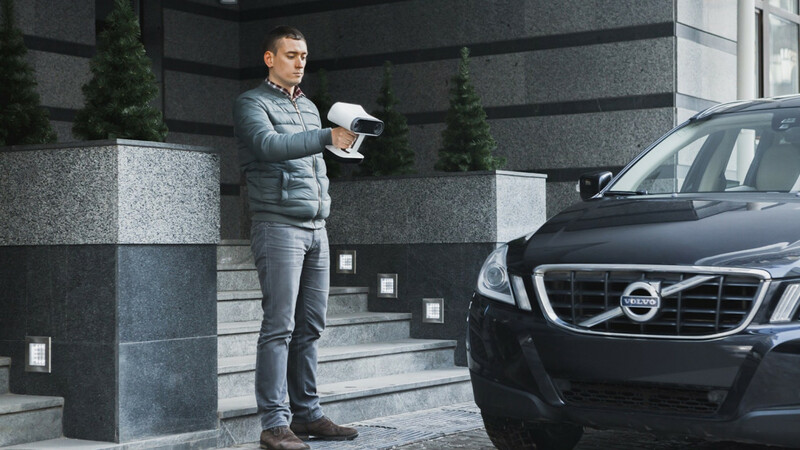 The Calibry is the latest handheld 3D scanner from Thor3D, the Russian 3D imaging company comprised of 50 engineers and mathematicians. Named after a Hummingbird known as Colibri for its petite size and unprecedented speed, Thor3D is marketing this new device as both highly accurate and precise. 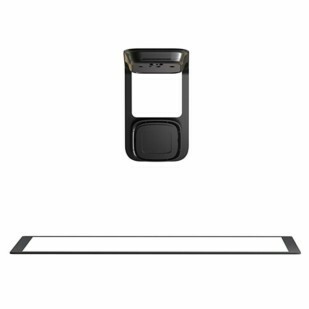 Designed to capture medium to large objects, one of the hallmark features of the Calibry 3D scanner is a built-in touchscreen that enhances usability. 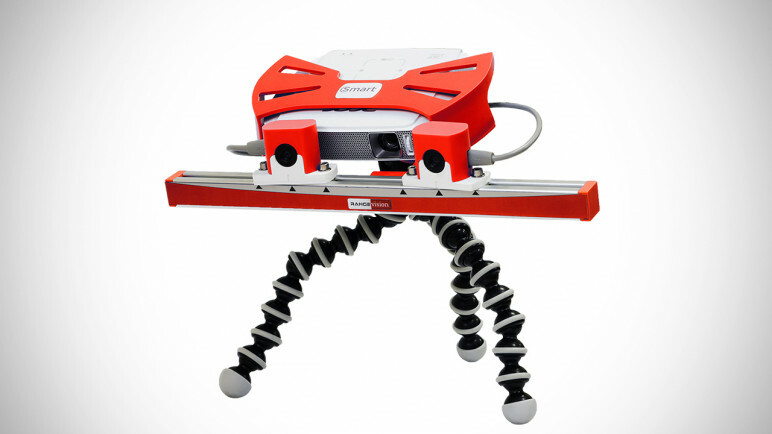 Weighing in at 700 grams (1.5lbs), this lightweight 3D scanner is capable of collecting up to 3M points per second. Thor3D is utilizing a patent-pending proprietary camera within this scanner, which the manufacturer claims will allow users will be able to capture “traditionally-difficult objects” like shiny objects, objects with sharp edges, and even human hair. Instead of releasing the Calibry under the Thor3D 3D scanner line, which tends to be on the expensive side, the company opted to create a new brand to represent its new feat of affordability and professional quality. 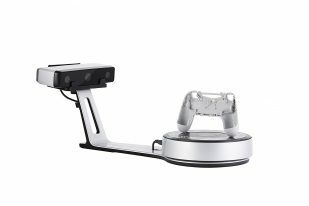 The Calibry 3D scanner is currently available to purchase for $5,790 and is expected to start shipping in Summer 2019. 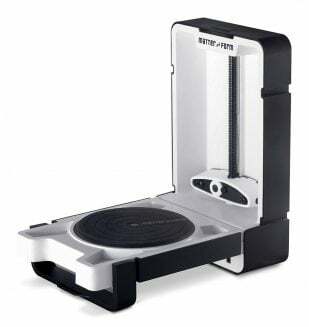 Striking a balance between professional capabilities and affordability is the distinctly designed peel 3D scanner. Despite boasting a low price tag of $5,900, the peel 3D scanner still offers some fascinating features that are absent from other devices in the same price range, such as the ability to accurately scan flat or shiny surfaces. This banana-like system utilizes stick-on targets to properly capture flat and smooth surfaces. For the usual 3D scanning applications, the process is as easy as pointing the scanner at an object and shooting – little to no preparation required. 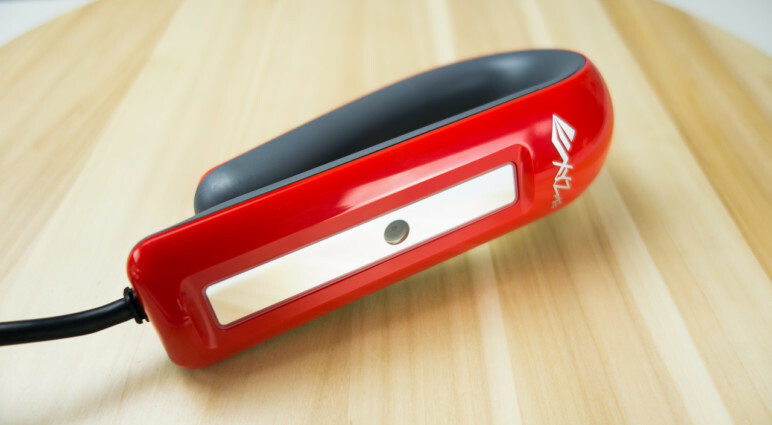 Using an LED system to generate the structured light, the peel 3D scanner is also safer to use than other laser-based systems. When employing the stick-on guides, the peel 3d is able to reach a scanning accuracy of 0.250mm and volumetric accuracy of 0.500mm volumetric accuracy. Although the base resolution is a mere 0.500mm, which is lackluster compared to other models, it’s a sacrifice that must be made for the sake of cost-effectiveness. 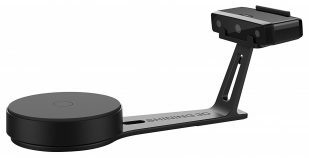 Looking for a standalone 3D scanner that offers professional-grade quality while also being incredibly easy to use? It may be worth taking a look at the new Metron E, a pre-calibrated and highly accurate 3D scanner line available in both the standard and HD version. The Metron 3D scanner generates high resolution and accurate scans in about 1 second per scan. With the E-HD model, the scanner is capable of capturing 4.9 million data points per scan at an impressive accuracy of up to 25 microns. Moreover, this device utilizes FlexScan3D scanning software to simplify the process even further, helping to streamline and automate the overall workflow. All in all, this selection is ideal for designers, engineers, educators, and researchers that want a top-notch 3D scanner without having to invest too much time or money. The basic model of the Metron E starts at $5,990, which isn’t too shabby for a professional scanner of this caliber. 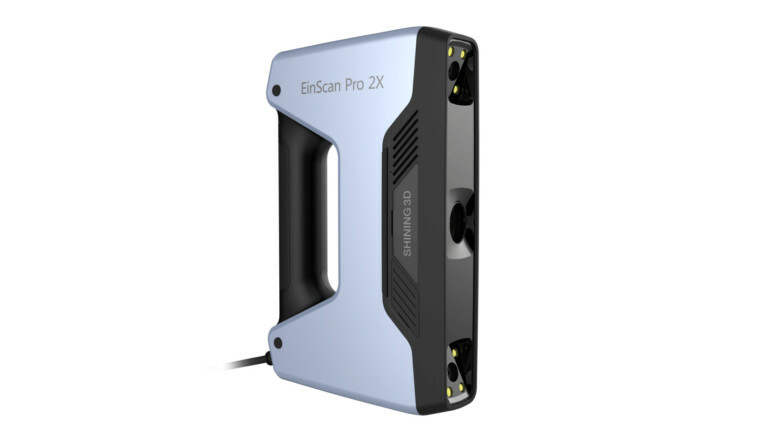 The EinScan Pro 2X is the latest handheld 3D scanning system from Shining 3D. 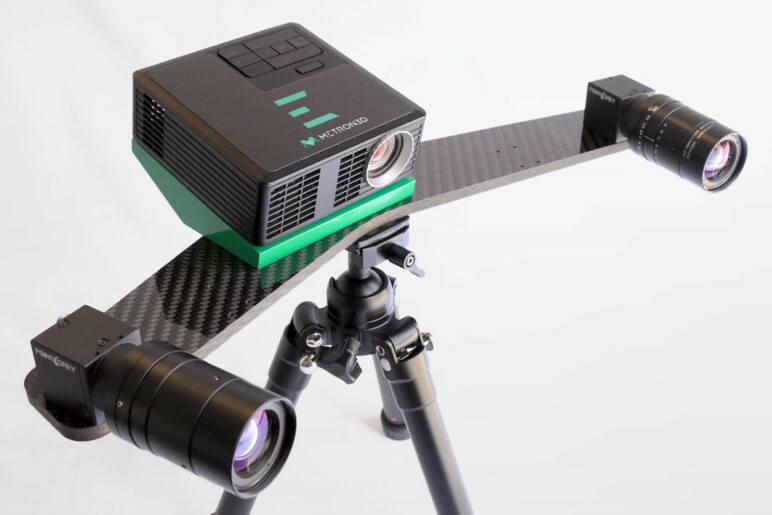 Like the EinScan Pro before it, this new and improved model is a lightweight and compact 3D scanner made for professional use, capable of capturing small-to-medium sized objects, and it does so at an incredibly high speed without sacrificing quality. 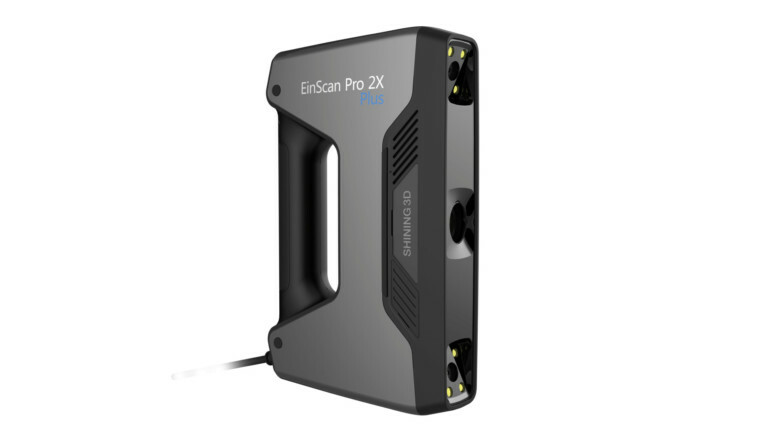 The EinScan Pro 2X offers four different 3D scanning modes: Handheld Rapid Scan Mode, Handheld HD Scan, and Fixed Scan Mode (both with or without a turntable). With Handheld Rapid Scan Mode, the EinScan Pro 2X is capable of processing up to 1,500,000 points per second (30 fps). While Handheld HD Scan Mode is a bit slower, it does offer an impeccable scanning accuracy of up to 0.05 mm. For both of these handheld modes, the volumetric accuracy can be improved by utilizing markers on the objects you plan to scan. When using Handheld Rapid Scan and Handheld HD Scan modes, the minimum point distance is up to 0.2mm, leading to the generation of high-resolution 3D data. You can also opt for the original EinScan Pro, which was previously awarded as our Top Pick before the Pro 2X version usurped it in our latest update. Released alongside the EinScan Pro 2X, the 2X Plus is an enhanced version that provides better specs in certain areas, including quicker scanning speeds and improved accuracy. Since we discussed the Pro 2X above, let’s focus this section of the differences between the two. The upgraded version provides a faster scanning speed for both Handheld HD Mode (1,100,000 points/s) and Fixed Scan (Single Scan < 0.5s). The EinScan Pro 2X Plus also has a higher single scan range, point distance, and working distance, making it slightly more versatile than the basic 2X model. According to the spec sheet, the scanning accuracy remains the same between the two 3D scanners, as does the volumetric accuracy and depth of field. Unlike the basic model, the higher-end model offers an increased depth of field, which improves the scanning speed and overall usability of the device. Priced around $8,537, this high-end 3D scanner is made for professional use, particularly for applications such as research, design art and heritage, engineering, and healthcare. Taking the ease of use and portable form factor of the EVA, the EVA Lite brings the price down by omitting the ability to capture textures. That may sound like a deal-breaker for some, but in reality it’s a shrewd refinement of the proposition of the EVA, making its high quality geometry capturing abilities accessible for those that require that alone. The result is a handheld 3D scanner suited for capturing geometrically rich objects (such as the human body, for medical professionals), without demanding too much computing power to run (since there’s no texture data to process). 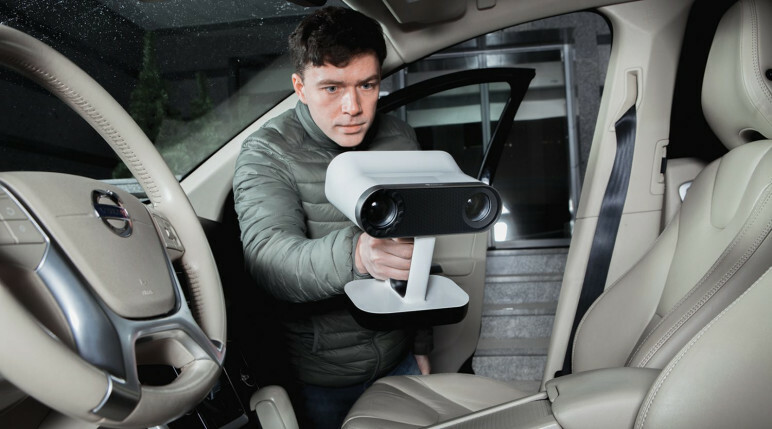 Launched at the start of 2019, the HDI Compact from Polyga is a 3D scanner line that is designed to provide professional-quality results with hassle-free operation. Comprised of three different models (C109, C210, and C506), the camera tech varies between around 1 to 5 megapixels. The basic model, the C109, has a 1.3 monochrome megapixel camera that is capable of capturing accuracy of up to 34 microns and an average of 985,000 points per scan. The other two iterations both offer higher accuracy and a larger view of field, with the C506 boasting a superior scan speed of 333 milliseconds. Using a blue LED light, the HDI Compact projects patterns onto the scanning object. Distortions in these patterns are then registered by the scanner, and only when this data is recorded from every angle can a 3D model of the object be compiled in the proprietary scan processing software called FlexScan3D. Not only is this software capable of stitching and repairing scan data, but it can also export models into the 3D printable OBJ and STL file formats. Aside from using one device as a standalone scanner, another possible application of this system is to rig an array of the scanners in order to quickly scan larger objects. At $9,990 for the low-end model and the C506 priced around $13,990, the HDI Compact line is definitely geared toward the professional market. 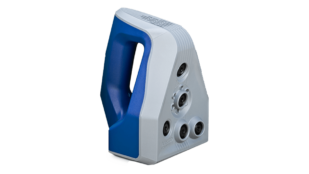 The Artec Eva is considered by many to be the best in class handheld 3D scanner. It is used in just about any field of work imaginable from the aerospace industry to orthopedics and vfx. The Artec Eva is particularly suited to medium-sized objects (including busts), capturing accurate full-color scans quickly and reliably. It’s possible to set up more than one Artec EVA 3D scanner to speed up the scanning process — an expensive proposition, but a welcome one to note the versatility of the device. Utilizing structured light for its scanning method, this makes it particularly safe for scanning people and animals. The EVA requires no calibration or warm-up time and is compatible with tablets, so the whole system is truly portable without the need for an external power plug. The in-house editing software is not free, however, and does not ship with the handheld 3D scanner. Since the data from the 3D scanner can be exported, any third party 3D editing software should be able to get the job done. Packing a lot of power into a portable package, the Creaform Go!Scan 20 is a white-light 3D scanner outputting professional-grade geometries and textures. Accurate up to 0.1mm with a resolution of 0.1mm, the system uses hybrid positioning to allow for simple and convenient handheld scanning of larger objects, with a workflow that could be considered point-and-shoot. The accompanying VXelements software boasts a number of optimization features to clean up scans, including automatic hole filling, improved facet capture and the clean rendering of ribs (useful for mechanical/structural parts). The included VXmodel allows for direct CAD integration of your scans. A Go!SCAN 50 is also available. Tailored to quick scans of larger objects, it captures at a lower resolution, but across a much larger field-of-view. On the higher end of the 3D scanning spectrum is the Artec Space Spider, a high-resolution 3D scanner that uses blue light technology to capture anything from small, intricate objects to large parts in high resolution. Priced just below $25,000, this industrial system generates 3D models with premier accuracy and vibrant color. As an advanced version of the original Artec Spider, this is an industrial-grade scanner designed for experienced CAD users who require high precision for applications like reverse engineering, additive manufacturing, quality control, and mass production. It’s able to conquer those pesky features that other scanners can’t handle, such as sharp edges and thin rips. What makes it special is the fact that it offers the quality of high-end, mounted scanners, but also prides itself on being a handheld device. So named because it is the king of the jungle in 3D scanning right now (we presume — could just be a fun coincidence), the Artec Leo is a step change in the 3D scanning market, offering scan resolution of a magnitude greater than the company’s already market-leading EVA scanners, while adding complete wireless functionality and on-board processing. The Artec Leo effectively removes the laptop or computer from the equation, allowing complete scanning freedom with no wires tethering the user to a workstation. Further to this revelation, the Leo improves upon it’s predecessors in every way with such features as 2.3mp HDR color textures, constructing models at 80 frames per second with data acquisition speed of 4-million points per second and a 173,000cm-cubed capture zone. It’s a hefty investment at around $25,800, but that’s the price you pay for something insanely different from what has gone before. 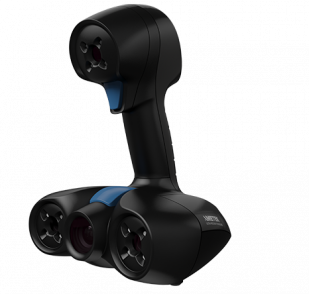 The T-Point CS is a industrial high-precision 3D laser scanner by Zeiss. Capable of scanning intricate structures, the Zeiss T-Point CS stands out among other industrial devices for its portability which enables highly precise 3D scans in a variety of scenarios. This portable 3D scanner is a reliable asset to compare the execution of a design with the original CAD file or creating tools based on the objects exact dimensions. Further to this, the device’s dynamic referencing allows for measuring 3D data on moving objects, such as those within the active working environment. A professional solution for demanding conditions. Before you decide to purchase a 3D scanner for yourself, it’s important that you know what this technology actually is and how it works. First, a 3D scanner captures an object or person. This image data is then transferred into a 3D modeling program, and from there can be altered or modified in the software, printed, inserted into a video game, and so on. After an object is scanned, the model can be edited or resized via 3D design software. After the model is prepared, it can export into an STL file and be 3D printed. Essentially, this means that anything you see in your daily life can be made 3D printable, whether it be a small object like jewelry or a large object like an automobile. 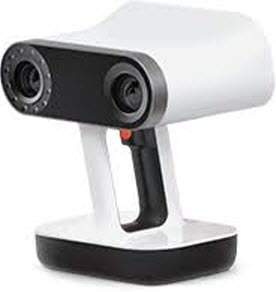 There are many different technologies and aspects to consider when shopping for a 3D scanner. Keep reading below if you’re looking for more information on 3D scanning technology! This 3D scanner technology predates the age of computers: After the invention of photography, scientists quickly realized they could apply the principle of natural stereo vision to their fields. Using images taken from two slightly different positions, they were able to measure and determine the location of points objects in 3D space, experts call this process ‘triangulation’. To this day, Photogrammetry is used by land surveyors to compile maps with high precision; this has proven to be especially useful in mountainous regions that are difficult to access for surveyors or to 3D scan by other technologies. Modern computer programs triangulate entire buildings or objects as small as shoes. Nowadays even phones can be turned into portable 3D scanners, simply by installing an app. The precision is largely due to the quality of the images. The more pixels you feed to your program, the more data it has to chew on. 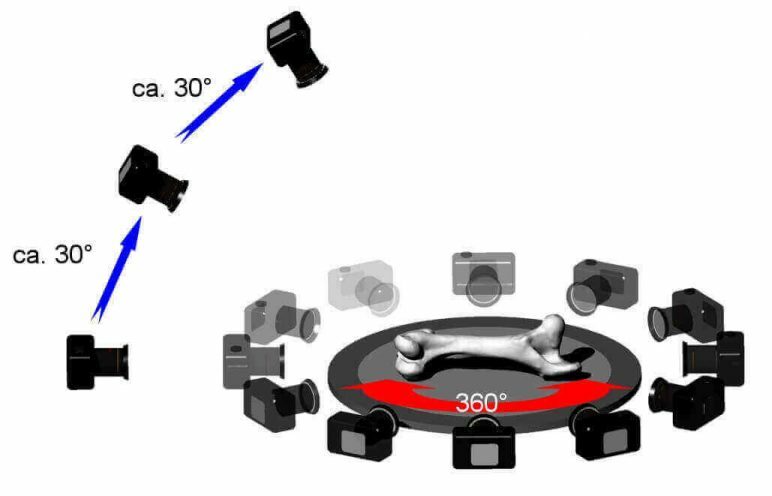 To generate a complete model many pictures have to be taken while moving around the objects in increments of 15 to 30 degrees; repeat this in different heights, especially when 3D scanning complex objects, i.e. that have many occlusions. Keep in mind that in order to triangulate a point, it needs to be photographed at least twice – otherwise your mesh will have holes. So don’t be shy when you snap your pictures. These devices project geometric patterns onto the surface of a given object, while a camera registers the distortion of the image. Based on the displacement of the pattern, it is possible to calculate the location of every point. Since the patterns can only be projected from one vantage point at a time, multiple 3D scans have to be combined to form a complete 360° mesh. Some manufacturers circumvent this constraint by mounting the object on a motorized turntable and stitching the 3D scans together automatically. These 3D scanners are very accurate, the resolution ranges in the tens of micrometers. Unlike 3D laser scanners, this technology is completely safe to apply to humans and animals. The 3D scanning range is limited to a few meters. Structured light technology is found both in stationary and in portable 3D scanners. Time of Flight (TOF) 3D scanners are even more sciencey. They determine the distance to an object by measuring the time a sent out a laser or infrared beam takes to be reflected to the 3D scanner. The essential ingredient in this device is the speed of light. The round-trip-time establishes the distance traveled by the light beam. If you consider that it takes sunlight a mere 8 minutes and 17 seconds to reach the Earth, you get an idea of how precise the sensors in these scanners are in order to work. But even the mighty TOF scanners have shortcomings, differences in temperature, humidity, and other factors affect the speed of light and impede the 3D scanner’s ability to accurately measure the round-trip time, so their accuracy is comparatively low, in the range of centimeters. They are mostly used scanning large structures like buildings. Like with other technologies, it is not possible to create solid meshes in one scan. TOF-3D-scanners using laser beams should not be used when 3D scanning people or animals. Many devices using this approach are designed as portable 3D scanners. Triangulation 3D scanners, aka laser 3D scanners, are similar to photogrammetry and structured-light 3D scanners in that they use the same basic geometric principle to determine the location of a point in space. The laser 3D scanner projects a laser beam on the object and a camera registers the place where the laser hits the object. Since the angles and measurements of laser and camera are known, the laser dot (or line) can be accurately located. These 3D scanners are famously accurate, the resolution ranges in the tens of micrometers. On the flipside, their range is limited to only a few meters. Triangulation 3D scanners emitting a laser line are capable of scanning moving objects. This technology is usually not found in portable 3D scanners. Contact 3D scanners physically touch the object which is resting on a surface or fixed to some form of rig that holds it in place. Usually, this is a slow process, as even minor vibrations can distort the scan. Though these 3D scanners produce precise scans that used quality control in engineering industry, the probes may modify or even potentially harm the scanned objects; for this reason, contact 3D scanners are not used for heritage preservation. 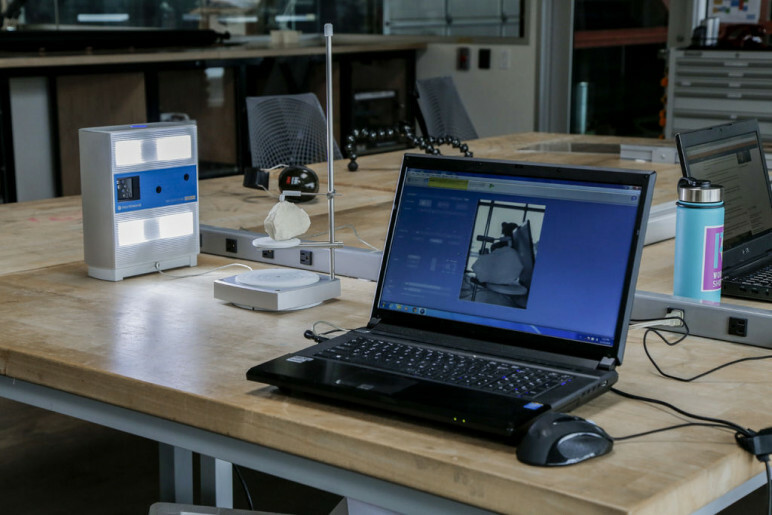 Selecting the right 3D scanner is no simple matter. There are many criteria to keep in mind before purchasing a device. For instance, a certain 3D scanner may be the best for architectural purposes, but may still prove unsuitable for prototyping. You may benefit from an affordable stationery scanner, or need the versatility of a handheld device. Before we dig into the different 3D scanners available on the market, let’s take a look at the different aspects that you should consider. We have compiled a list of the most important characteristics to consider when shopping for a 3D scanner. The first question you should ask yourself is: what do you want to use the scanner for? The requirements vary depending on the field. For example, a game developer simply creating game assets will be interested in not just a high-resolution mesh but also the texture of the object. If so, photogrammetry will be the logical solution in this case. However, a maker who wants to 3D print something he saw in reality will be more interested in the exact measurements of the object. Therefore, they will probably choose a 3D scanner based on structured light. Your should also decide very early, where you want to 3D scan your objects. 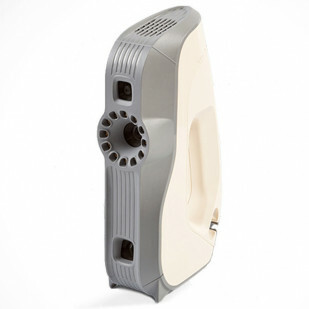 If they are relatively small and you can bring them to your office or home, buy a stationary 3D scanner. 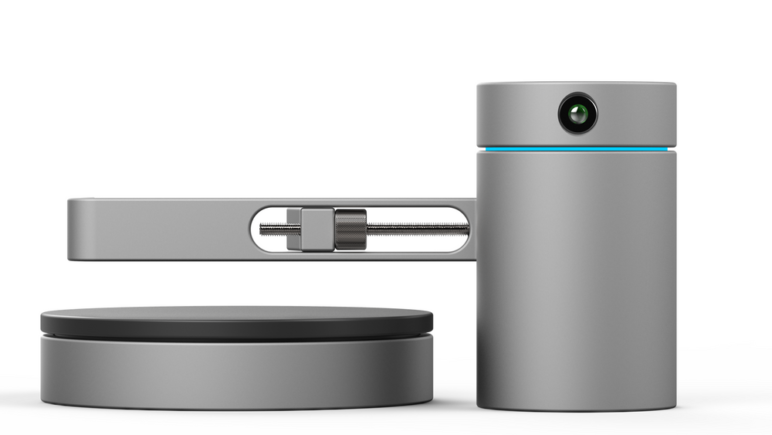 If not, you need a portable 3D scanner. You should determine what it is exactly that you want to 3D scan. There is no device that covers all areas of application. For 3D scanning people and animals, you can’t use a 3D laser scanner since it might cause damage to the eyes. Photogrammetry might be a good choice, but this technology requires the subject to stay perfectly still. So while you might get great 3D scans from your friends and family, you may find your dog a difficult subject. Laser 3D scanners are a great choice if want to scan large, inanimate objects such as buildings or vehicles. In case you are interested in reverse engineering, that is to say, you need extremely accurate measurements, structured light or contact 3D scanners will do the trick. However, Contact 3D scanners are not an option in projects concerned with heritage conservation, since the process may alter or even destroy delicate items. In this case, the best 3D scanner is a structured light scanner. Most consumer 3D scanners (structured light) are designed for 3D scanning objects the size of your average tea kettle from a close range. But it’s true, that you can often ‘stitch’ multiple 3D scans together into one piece. Generally speaking, the bigger your objects are, or the farther away, the more expensive a 3D laser scanner will be. Exceptions are photogrammetry programs, that are normally reasonably priced and produce excellent results. Another factor to keep in mind while buying the best 3D scanner is the surface of your object. Both photogrammetry and structured-light 3D scanners have serious problems with reflective and transparent surfaces which cannot be processed and will result in distorted and fragmented meshes. Even the best 3D scanner will not produce satisfying results when faced with ill-suited surfaces. If your heart is set on these technologies, this constraint is often overcome by applying a thin layer of opaque lacquer. Finally, the single most important feature in many fields of application is the accuracy of the 3D scans. 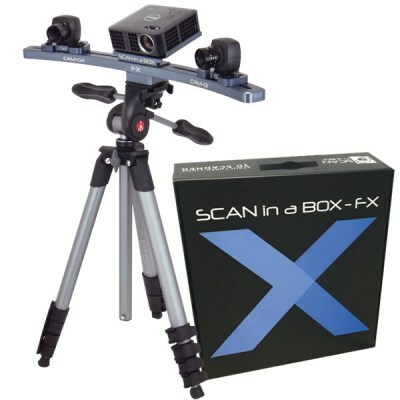 Contact 3D scanners are capable of extreme accuracy, but their prices range from $30.000 to $200.000. Again, you should ask yourself: what do you want to use the scans for? How much resolution is enough to get the job done? License: The text of "30 Best 3D Scanners of Spring 2019" by All3DP is licensed under a Creative Commons Attribution 4.0 International License.